Student Grade Calculator for Excel makes it simple for teachers to grade students. It quickly weights the students grades on a per-assignment basis. For example, if there are 5 papers and 2 tests, the tests are each worth 25% of the student's grades and each paper is 10% of the grade. 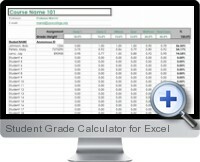 Student Grade Calculator for Excel automatically weights the grade for each assignment and calculates the student's course grade. The template can be easily modified to meet specific needs.